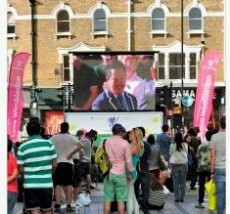 Love Wimbledon’s Big Screen returns to The Piazza this summer screening The Wimbledon Tennis Championships LIVE as they happen, 29 June – 12 July NB – Wimbledon Tennis is a week later this year. The special AstroTurf summer lawn complete with deckchairs is being brought back for you to once again enjoy watching the tennis whilst the stars play just up the hill! The British Grand Prix will also be screened on Sunday 5 July.